They are right next door to me, I got to check the office one time. Nice, how about make long interview for PV? Yuneec International, the world leader in electric aviation, entered two new categories with the unveiling of the all-new fixed wing Firebird FPV and all-new HD Racer for a more immersive flight. Additionally, the company announced the second generation of its proven six-rotor hex platform, Typhoon H Plus - its most powerful consumer product yet. The category expansion and product line advancements are a result of Yuneec's ongoing commitment to deliver industry leading technologies and pilot-centric features for an unparalleled electric aviation experience. "We take great pride in addressing what our customers desire in drone technology to ensure each evolution in our product line pushes brand and industry standards," said Wenyan Jiang, chairwoman and co-founder of Yuneec International. "The entrance into the fixed wing and racing categories provides an opportunity for pilots and enthusiasts to use Yuneec products in fun, new ways and expand their creative possibilities." Typhoon H Plus is packed with powerful features and professional image quality that photographers at any skill level will enjoy. 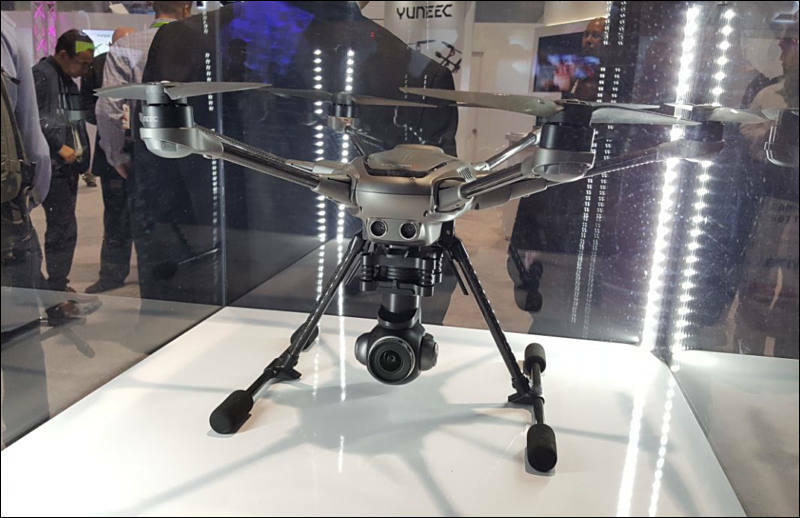 The second generation of Typhoon H features Yuneec's all-new, larger, highly stable six rotor hex airframe. With a 40 percent reduction in noise from previous hex models, and stable flight in winds up to 30mph, H Plus leads its category in stable flight and quiet operation. Typhoon H Plus comes equipped with Intel® RealSense™ Technology, a sophisticated collision avoidance system that detects obstacles and intelligently navigates around them. With this feature, drone pilots can worry less about obstacles and focus more on their flight path and camera work. Additionally, the Typhoon H Plus is accompanied by a newly redesigned Android-based ST16S controller, which includes a large, high brightness seven-inch integrated display and HD 720p video downlink for stunning real-time video reception. Availability for the drone has yet to be announced and neither has UK pricing however the USA price is said to be $1800.